Last night I watched the shuttle launch with Ben. His new fascination is shuttles and all things space. He's still trying to grasp that, fortunately, we live on Earth. 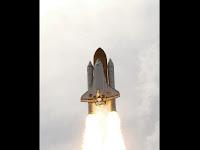 After the Launch, NASA replays from different angles, and Ben thought each one was a new shuttle going up. After the disappointing loss of camera feed on the liquid tank, I turned it off, and BEN CRIED. He wanted to watch the astronauts! He wanted to watch another shuttle! So my duty is done - I know how an ally to encourage a trip to Florida for a space launch b/f NASA discontinues the shuttle. YAY ME! I always wanted to go to one - you'd think all those years of living in FL - I would have made it - came close one time - but of course it got delayed.